Martignetti professor of philosophy Sean D. Kelly and senior lecturer on philosophy Sheryl Chen have been appointed faculty deans of Dunster House; they succeed Roger Porter and the late Ann Porter (who died on May 17 after health challenges accelerated unexpectedly). Kelly led the recent overhaul of the undergraduate general-education curriculum (see harvardmag.com/gened-rev-15 ). The couple have two sons, Ben and Nathaniel. Lakshminarayanan “Maha” Mahadevan, who is England de Valpine professor of applied mathematics, of organismic and evolutionary biology, and of physics, and Amala Mahadevan, a senior scientist at the Woods Hole Oceanographic Institution and faculty member at MIT, have been appointed faculty deans of Mather House; they succeed Christie McDonald and Michael D. Rosengarten. Maha’s research was featured in “The Physics of the Familiar ,” the magazine’s March-April 2008 cover story (the year before he won a MacArthur Fellowship), and in many articles since. 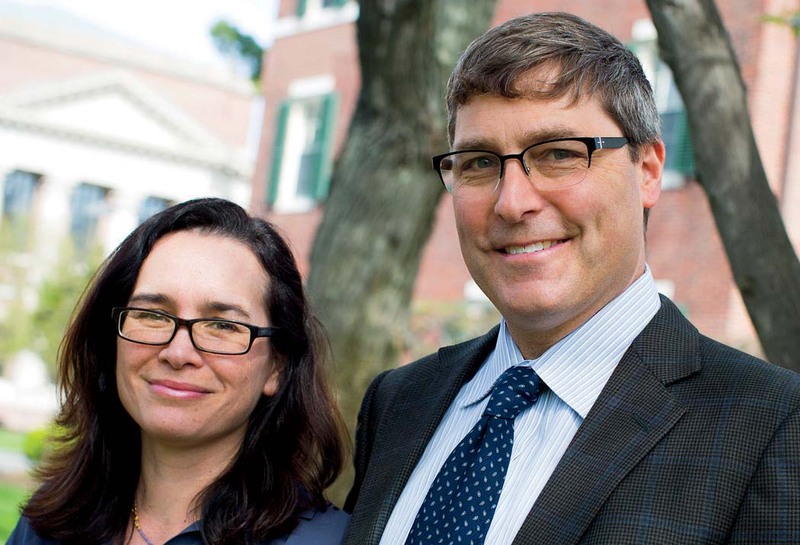 The couple’s children, Aditya and Kausaly, both attend Harvard College. Beginning this fall, new English concentrators will be required to fulfill a “diversity in literature” requirement. The language of the faculty’s proposal “asks our students to engage with the ongoing histories of patriarchy, empire, and heteronormativity in and through literature” by “encountering the creative achievements associated with alternative traditions, counter-publics, and archives of dissent.” The topics will include, among others, “the historical construction of markers of difference such as race, ethnicity, class, gender, and sexuality” and “the imaginative and formal innovations produced by disenfranchised groups.” Qualifying courses (which include “Early Women Writers,” “The Rhetoric of Frederick Douglass and Abraham Lincoln,” “Global Fictions,” and others) will be so designated; over time, the requirement is expected to affect the design of other courses. Separately, Yale overhauled its English requirements this year, too; students will be expected to gain exposure to literature from more periods, and the department will also increase the number of courses featuring works by women, people of color, and authors from non-English-speaking countries who wrote in the language—a concerted effort to reflect the diversity of Anglophone literature. The John Simon Guggenheim Memorial Foundation has conferred fellowships for the coming year on faculty members Adriaan Lanni, Touroff-Glueck professor of law; Martin Puchner, Wien professor of drama and of English and comparative literature (Harvard Portrait , May-June 2013, page 50); and Natasha Warikoo, associate professor of education. Puchner, who chairs the undergraduate program in theater, dance, and media (see the report in the May-June 2016 issue , page 18), will also be resident at the Cullman Center for Scholars and Writers at the New York Public Library during the year. MIT’s The Engine, a venture-capital and accelerator initiative aiming to support local startups in biotechnology, robotics, medical devices, and related fields, with a facility in Central Square, has attracted some $150 million in initial funding. The institute contributed $25 million; the balance came from outside investors.…The Stanford Board of Trustees visited Harvard and MIT during its April retreat. A Stanford News report said that during their Harvard day, the trustees heard presentations on sustaining the arts, humanities, and social sciences alongside physical sciences and engineering. At MIT, they learned about the application of digital technologies to teaching and learning; entrepreneurship; nanoscience; urban studies; and the social implications of technology.…Yale’s pilot program of applying a carbon charge to 20 campus buildings proved effective in reducing carbon emissions, according to an initial assessment.…Duke’s arts and sciences faculty tabled a proposed revision of the undergraduate curriculum, according to Inside Higher Education; the effort sought, among other goals, to simplify complicated course requirements and to “rethink our vision for disciplinarity as embodied by the curriculum,” but has not yet attracted the desired degree of consensus to proceed to a vote. Even as the two-year reconstruction of Lowell House gets under way (the picture shows the former Harvard Community Garden, established in 2010, which has yielded to a staging area for the work), Faculty of Arts and Sciences dean Michael D. Smith announced that architects will begin drawing up plans for the renewal of Adams House, the next undergraduate residence to be updated and reconfigured for the twenty-first century. The work would not begin before 2019; read more at harvardmag.com/adams-redo-17 . John F. Manning, Bromley professor of law, has been appointed dean of Harvard Law School, effective July 1, succeeding Martha Minow. A member of the faculty since 2004, Manning, a scholar of public law, teaches on subjects ranging from administrative law to statutory interpretation. Read more at harvardmag.com/hlsdean-17 . Admit them…And they will apparently come: the College reported that nearly 84 percent of applicants offered admission to the class of 2021 have accepted: the highest “yield” since 1969, when 83.1 percent of invited class of ’73 members opted for Cambridge. …Or not. As this issue went to press, The Harvard Crimson on June 4 reported on a darker side of memes (the subject of The Undergraduate  column): the College’s decision to withdraw offers of admission to members of the class of 2021 who shared explicit and derogatory memes “mocking sexual assault, the Holocaust, and the deaths of children” in a closed Facebook group. Admitting them…The Mastery Transcript Consortium, comprising more than 100 private schools nationwide—including elite institutions such as the Dalton School, Cranbrook Schools, and the Phillips Academy in Andover, Massachusetts—has proposed doing away with traditional high-school transcripts. Instead, members propose that students present evidence of proficiency in diverse skills at varying levels of difficulty. Whether the idea takes hold or not, it is indicative of changing criteria (such as making standardized tests optional) and methods of assessment spreading across the admissions landscape. Radcliffe fellows. Among the Radcliffe Institute’s 52 fellows next academic year are 11 Harvard affiliates, including Pforzheimer University Professor and University Library director emeritus Robert Darnton; former U.S. ambassador to the United Nations Samantha Power; and former Law School dean Martha Minow. The complete roster is available at harvardmag.com/rias-fellows-17 . Arts in academia. Dan Byers, previously senior curator at the Institute of Contemporary Art/Boston,has been appointed Robinson Family director of the Carpenter Center for the Visual Arts. Separately, Damian Woetzel, M.P.A. ’07, a former principal dancer with the New York City Ballet (and visiting lecturer at Harvard Law School), has been appointed president of the Juilliard School. Harvard Law’s ladder. After a three-year trial run at the College, the Law School is extending its Junior Deferral Program. Beginning this fall, any college junior can apply for admission; acceptances will be conditioned on successful graduation and a minimum of two years of work, study, or research or fellowship opportunities. Beyond maintaining a strong pool of applicants in an increasingly competitive environment, the program encourages students who study science, engineering, and related fields to consider preparing for legal careers.